This kit requires assembly of the pixel strips. Pixels must be snapped into strips with proper spacking. Strips must be trimmed and folded. Strap stubs are fabricated using scrap pixel strapping. The straps are then cable tied to the top hub. This requires about 2-4 hours of work and use of about 100 cable ties. All parts are included. Factory assembled (in the USA) kits have all this work already completed. 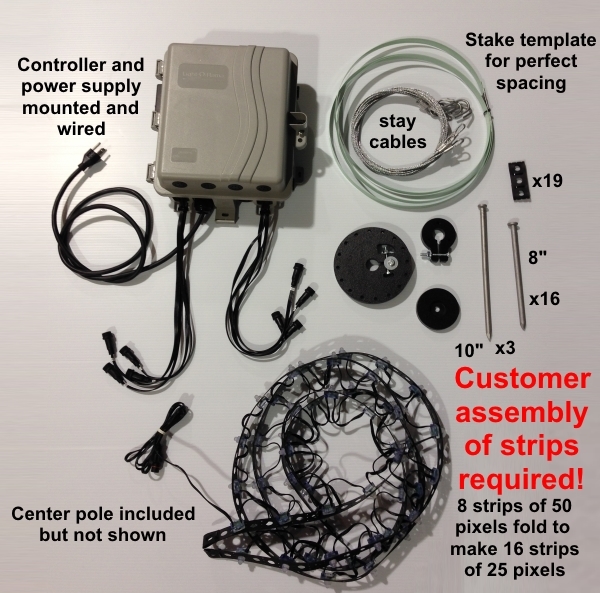 IMPORTANT: THIS PIXEL TREE USES BLACK PIXELS, WIRES AND STRIPS!